Genyornis newtoni, weighted about 500 pounds and stood seven feet tall. It was a bird, and this is where the whole bird-dinosaur thing gets real. This is one of several giant birds that went extinct fairly recently, and in many cases, humans as suspected. Genyornis newtoni lived in Australia, and recent research suggests that humans may have played a role in the extinction of this dinosaur laughingly called a bird, about 40,000 years ago. The evidence consists of clusters of egg shells that are burned in a way the scientists suggest most likely done by humans. So, the idea is that by harvest the eggs of this giant bird, human contributed significantly to their extinction. Don’t assume this is right, or if it is, simple, yet. The whole human-caused extinction of megafauna, in Australia and elsewhere, is a dynamic area of research and things change all the time. Also, determining the cause of burning is pretty tricky, and rarely conclusive. I’ve been either following closely or directly involved in research in these areas for a long time, and I advice skepticism. Still, just because it is complex does not make it unlikely. I tend to think this research is basically correct, I just want to hedge my bets. Although the temporal overlap between human dispersal across Australia and the disappearance of its largest animals is well established, the lack of unambiguous evidence for human–megafauna interactions has led some to question a human role in megafaunal extinction. Here we show that diagnostic burn patterns on eggshell fragments of the megafaunal bird Genyornis newtoni, found at >200 sites across Australia, were created by humans discarding eggshell in and around transient fires, presumably made to cook the eggs. Dating by three methods restricts their occurrence to between 53.9 and 43.4?ka, and likely before 47?ka. Dromaius (emu) eggshell occur frequently in deposits from >100?ka to present; burnt Dromaius eggshell first appear in deposits the same age as those with burnt Genyornis eggshell, and then continually to modern time. Harvesting of their eggs by humans would have decreased Genyornis reproductive success, contributing to the bird’s extinction by ~47?ka. Miller, Gifford, John Magee, Mike Smith, Nigel Spooner, Alexander Baynes, Scott Lehman, Marilyn Fogel, Harvey Johnston, Doug Williams, Peter Clark, Christopher Florian, Richard Holst & Stephen DeVogelHuman. 2016. 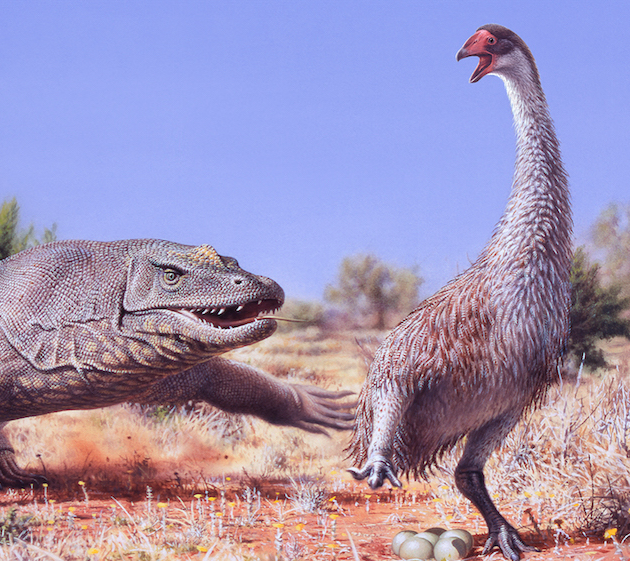 Human predation contributed to the extinction of the Australian megafaunal bird Genyornis newtoni ~47?ka. Nature Communications 7:10496.